the forest floor blurring as she flees the dogs and torches. Werewolf, monster -- those are the names given her kind by the humans who hate them. Kenzie Macleod has spent her whole life hiding what she is, and she’s not about to open up to any man, even one as powerfully attractive as wildlife expert Josh Talarkoteen. But legend says that a Changeling cannot escape the call of her true mate, even in the wilderness of backcountry Alaska. An isolated archeological site, a terrified Changeling cub, a secretive research center -- as Kenzie and Josh face the ultimate betrayal, his obsidian eyes promise untold pleasure and hint at dark secrets of his own . . .
Well let me start by saying this is not normally a book I would read. In fact this is the first werewolf book I have ever picked up. I don’t know why but I just don’t do werewolf books. However, I was glad I did read this book. I actually enjoyed it. Both the main characters and sub ones had interesting roles in this book. I liked that this book was more in a mystery kind of way rather than a love story, yes the romance was there but done with a bit of a spin. The main focus was on the mystery and solving where Anya the little cub came from and how to help her. Along the way you see the budding romance and more develop within the characters. Josh is a human who has a past still haunting him literally. While spending time with Kenzie he learns how to use that past and get over it. 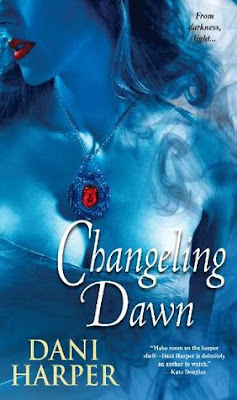 Kenzie a changeling (werewolf) is fearful of humans due to event in her past. With the help of Josh and her need to help Anya, Kenzie learns that not all humans are bad; in fact some can be trusted. You just have to have faith sometimes. You what Debbie? When I first started blogging, I didn't read paranormal book either. But now I can't seem to get enough. I hope you enjoy many more in the future. I agree a werewolf story can be great if done right.